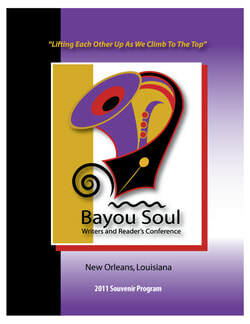 Want to Advertise in the 2018 Bayou Soul Writer's & Reader's Conference Souvenir Program? Take the opportunity to market your book, literary event, service and/or company to our participants! We've also placed the entire souvenir program on our website for greater exposure until next year's conference. Take advantage of this great opportunity! Space is limited! Want to Advertise your book club, event or service in our 2018 Souvenir Program Book? Ad space will be given on first come first serve basis. We'll start taking Submission for Print Ads only. Space is limited!! Take advantage of this great opportunity to promote your business through our growing network of authors, publishers and readers !!! 1.) Ads should be the exact size specified on this page. 2.) Ads must be saved in jpg or pdf format at 300dpi resolution. Anything less will not be accepted. 4.) Please save your ad in color. Interior pages outside of the front & back interior will be printed in black & white but will be downloaded in full color for the website. 5.) Ads should be print ready to be placed in program. BSWRC is not responsible for any corrections. BSWRC has the right to reject any ads.